The new Suzuki Vitara marks a strong return with a fresh urban focus, good value, loads of kit and a decent drive. Despite being a small SUV with a familiar household name, the Suzuki Vitara was never a part of the wildly popular crossover group that is forming an ever-more-lucrative slice of the family car market. Unlike 25 years ago, the all new Vitara now finds itself among a raft of similarly small crossovers - the Nissan rel="noopener noreferrer" Juke and the Renault captur to name a few. So for the fourth generation car, Suzuki's focus was on improving comfort, efficiency, performance and refinement rather than making it a mud-plugger like it used to be. After all, being a late entrant to the ultra-competitive segment that becomes more congested with each passing year, the crossover will need something going for it. It's that look that will also distinguish the Suzuki crossover from its stablemate - the S-cross - which it shares its platform with, but the latter is focused more on compact people mover-style roominess and packaging. 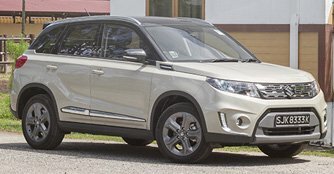 Park the Vitara next to the S-Cross and they look virtually the same size, but the Vitara's official dimensions of 4,175mm x 1,775mm x 1,610mm (L x W x H) reveal that it is actually slightly shorter and narrower than its sibling. It's still bigger than some of its rivals, though, so that definitely allows it to have a sizeable presence on the road. The Suzuki Vitara has gone from being a rugged, no-nonsense off-roader to being more of a 'lifestyle' crossover, with the focus on trendiness rather than toughness. 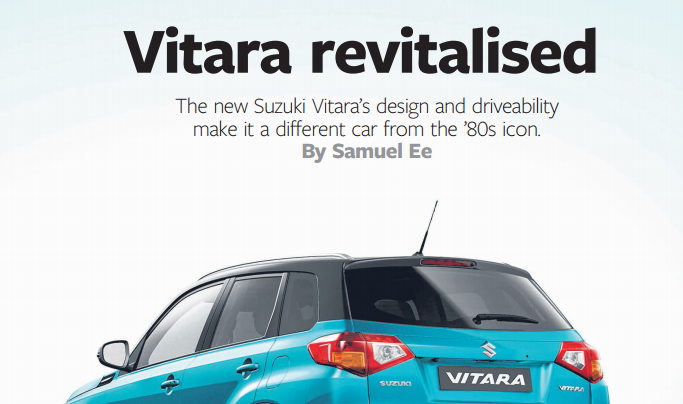 The car breaks the mould for Suzuki in terms of design. Stylistically, some may even go rel="noopener noreferrer" as far as saying it has more than a dash of Range Rover Evoque about it, thanks to the different colours available with a contrasting roof and the clamshell bonnet as well as the grille. Inside, the Vitara is very comfortable, with supportive, suede-finished seats and loads of light that fills in from the panoramic sunroof, which is standard on 4WD models. The family resemblance between both the S-Cross and the Vitara is obvious in keeping with its younger demographic profile, but it's the latter that picks up trendier circular air vents with louvre rings that match the colour on the outside as part of a personalisation option. Also complementing the exterior is the configurable panel ornament that runs almost the length of the dashboard, allowing the Vitara's interior to stand out from other Suzuki's. And with the Premium model that you see here, a smart 7.0-inch clarion touchscreen system that is straightforward and easy to use comes standard. 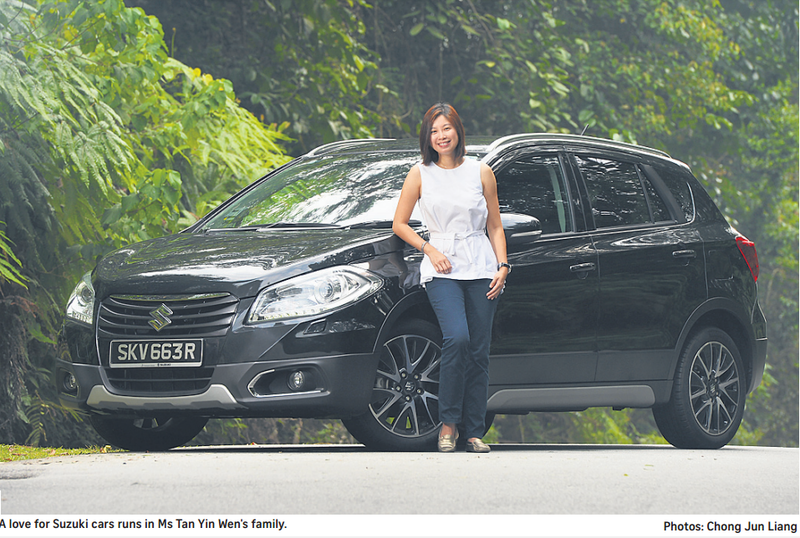 Years of experience in building compact SUVs really show in the car's practical interior. It's relatively spacious and features lots of storage areas, in addition to a decent boot of 375 litres. Ingress and egress is fairly easy too, thanks to light and wide-opening doors. Added practicality comes in the form of underfloor storage while no load lip means sliding heavy items is convenient. Unlike in the old Grand Vitara, the new model's boot lid hinges from the roof instead of the side of the car, making the load bay easier to access. Under the bonnet is a 1.6-litre naturally aspirated four-cylinder petrol motor. Although it shares the same platform as the S-Cross, the Vitara's six-speed automatic transmission, compared to its brethren's CVT, completely transforms the driving experience. While the motor may sound a little underwhelming on paper, it revs smoothly and willingly and punches above its specification, thanks in part to exceptional lightweight engineering and smart gearing. Unsurprisingly, one benefit of having a smaller engine is fuel consumption. We averaged 12.1km/L during our time with the car, which is more than acceptable given the fact that we drove it pretty hard. The crossover also proves to be a reliable road partner. The soundproofing is surprisingly good, and the handling is trustworthy. Suzuki claims that it set out to make the new Vitara handle like the fun-to-drive Swift and it appears close to pulling it off. Although the extra weight and higher centre of gravity means the crossover doesn't change direction quite as quickly and it rolls a little more than the hatch, it still clings to the road eagerly when you up the pace. The new Suzuki Vitara is a rather likeable little crossover. It is everything you expect from the Japanese carmaker - affordable, competent, fun to drive, humble and well-built. And yet it is also everything you don't expect from Suzuki - fresh and feature packed. As an all-seasons vehicle, the four-wheel drive Vitara is a practical choice. Of course, it may not climb a mountain or cross a river like the Jeep Wrangler or the Land Rover Defender, but it's still perfectly capable of crossing a muddy field if you decide to go off the beaten track up North. Sometimes, it's better to be late than never. Some customers remain loyal to just one marque as a matter of personal needs and preference.